Below are some of the different hobbies that I am involved in during my free time. These hobbies tend to cover a wide range of topics, with some relating to my field of study, and others not nearly as much or not at all. Even so, they are all topic that interest me and bring me joy while participating in them. The topics bellow are listed in no particular order, and I attempt to update the information about what I am involved in within each of these hobbies as regularly as possible. Amateur radio had been a hobby I wanted to get into for quite some time. My father and I purchased some inexpensive dual band radios a few years ago with the intent of getting our licenses, though we never followed through. Over the summer we found that a local radio club in Sonoma County was holding a weekend long study session and would be administering the test at the end of the weekend. We decided to sign up for the course and took the test. Both of us passed and the entire weekend was a great experience. Having just taken a class on transmission lines; I was able to apply all that knowledge to topics covered in the class. It was great to see the topics I had learned in classes being applied to real world hands on scenarios, something that is not always possible with labs, and other school related projects. Since taking the class, I have volunteered with the local Santa Rosa club to provide communication for events in Sonoma County, as well as joined the local Amateur Radio club at Oregon State, W7OSU. At this time I am the treasurer for W7OSU, and also run net control for bi-weekly nets that we host on our clubs repeater, located outside of Corvallis. The club also has a second repeater on campus located on the top floor of Dearborn Hall. Along with being treasurer, I also organize club meetings, and have been cleaning up the club room in Snell Hall. This include organizing the room, setting up new computers provided by our club sponsor who is also the director of Information Technology for the College of Engineering. Recently, the club has also been contacted by the University of Oregon's Department of Emergency Management who wish for us to help them set up a radio room to be used in case of emergency. While organization and logistics are a large part of what I do for W7OSU, the real reason I enjoy amateur radio, and why I got into the hobby is because of the technical aspects. Because the hobby directly related to my field, and lets me utilize my skills it makes it a great place to practice, and learn more practical areas of electrical engineering. Indeed many of the members of the Sonoma County club are retired, or current engineers who have worked at HP, and later Keysight. One of the more recent technical projects I have worked is a dual band dipole antenna for 2M and 70cm based on this design here. I had to change the design a little bit to accommodate different fittings, which meant I had to re-do some of the calculations for the length of the antenna to make sure it was in the correct frequency range. I also decided on a different mount system to allow the antenna to easily be mounted on top of a pole with a threaded top, or attached to the side of a pole with hose clamps. Currently I have it attached to a chair on my deck, and can pick up and communicate with repeaters as far away as Salem and Eugene as well as our local repeaters closer to Corvallis. Bellow is a photo of the antenna I contructed, as well as my radio set up at my appartment. While I have only been employed in IT for the last 3 years at the Oregon State College of Business IT department. Doing IT and systems administration has been something that has interested me for quite some time. The first system one might call a "Server" that I ran was a Minecraft server that I hosted on an old HP Core2 Quad desktop running Ubuntu and Hamachi in my parents laundry room when I was 15. Since then, systems administration has been a hobby that has always kept me intrigued and brought a lot of joy. During highschool, I would also purchase computers from the local landfill and refurbish them to test and mess around with. I also worked on refurbishing a number of desktops, donating and setting them up for a community center in the Mission District of San Francisco called the Precita Center. They were used to teach underprivileged kids photo editing skills and other after school workshops. Since I was in highschool, I have also provided IT support, for my grandparents small business EASC, a third party claims administrator located in Santa Rosa. They use legacy systems running an old DOS program called Nutshell. This requires Windows 98 or older to run, meaning we have to keep around a few old machines and keep them alive. As payment for providing IT support and administration for them, I am able to host this server along with a few others at their office. I also host backup servers at my work in the College of Business as well as at my parents house, which provide a mirrored backup of the file storage server that runs at EASC. While it will most likely not be my profession for very much longer, it is still something that I love doing and continue to help others do. Recently I also helped a very good friend of mine set up his own storage server in the basement of his families home. I believe strongly in people owning their own files, and not trusting them to a third party company such as Dropbox or Onedrive. If your system is set up correctly, then it can be even more secure than those services, and usually even less expensive. Bellow are some photos of the server nook at EASC. Most of the stuff that I use for my servers has been either handed down to me, purchased used, or purchased at the local landfill. The server rack is a half depth and meant for audio equipment though it does well for my purposed. The servers include two 1U servers with Intel Celerons. One acts as the router for the office and runs Pfsense. The other runs Debian and hosts a document editing server, with plans to add a Firefox Sync server as well. There is also a 2U server that runs Windows Server 2008, and services EASC, providing local storage for the office along with a Fax, and Print server. The 3U server is the primary server that I run. It's roles include a file storage server running Nextcloud. Media streaming using Plex, and web hosting with Apache. This website along with all the others I host are located on this server. This server includes a disk array of 4 3TB hard drives in raid5 providing a logical size of 6TB with room for expansion in addition to redundancy. The backup server that is hosted at my work in the College of Business is an older Sun Microsystems Sunfire server running VMware ESXI. Hosted on here are a backup server, as well as a Windows 8 workstation and a few test boxes. I first started being interested in drones the summer after I finished highschool. My best friend and I decided that we were going to build a drone, and without much research we began the process of constructing a quadcopter. We thought that we could use an aluminum frame, and a control system designed around an Arduino. Our frame ended up being massive, and our Arduino code never quite worked right; almost killing us once when the drone flew straight towards us before crashing into the ground at our feet. 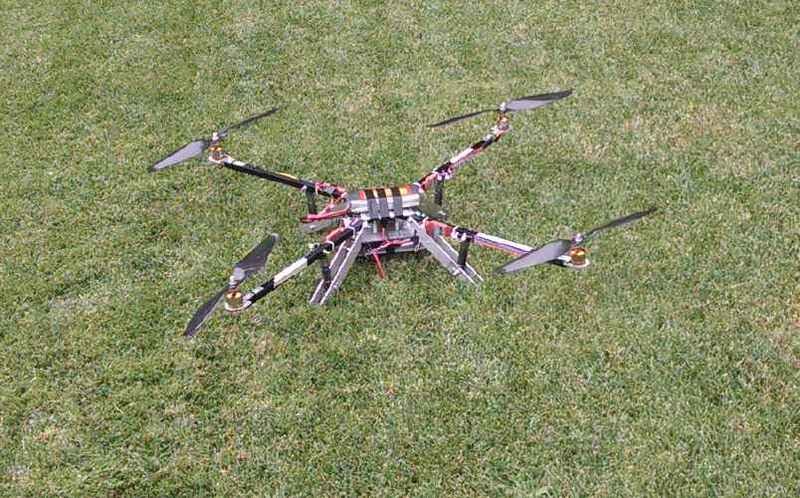 We then tried building a very inexpensive hexacopter kit my friend had purchased from China. This had potential to work, and more than likely would have had we thought to program the flight controller provided with it. Instead we simply attached it to the drone and tried to get it working. The results of which you can see below. After summer both of us headed to college and there we gained an immense amount of knowledge on the subject of drones. I joined the Oregon State Robotics Club and through my mentor who would later go on to work for SpaceX learned a great deal about what is actually needed to construct a working drone. What was great about learning from him was that he was designing his own flight controller, and had designed others in the past that had actually worked. This helped to give me a greater in depth knowledge about the inner working of unmanned aerial vehicle. While learning from him, I also designed a power distribution board to be used in conjunction with his flight controller, and the design for that can be seen on the projects page. 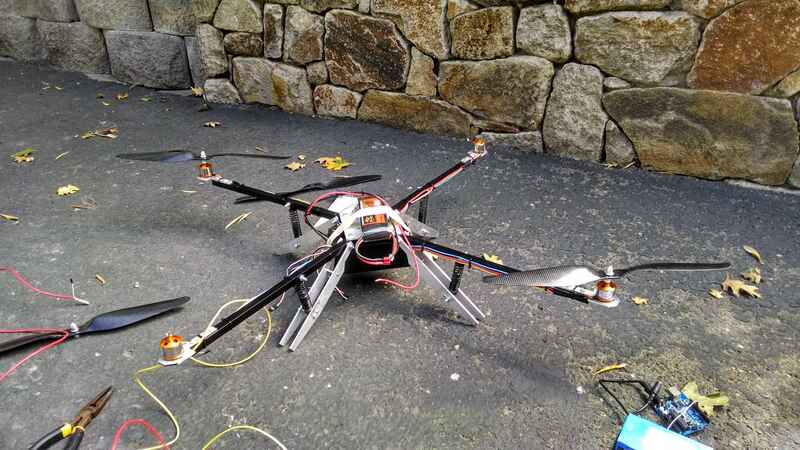 After my freshman year learning from Soo Yun, my friend and I were able to construct multiple working drones using a few different flight controller systems, including the CC3D and Naza. Some of the flights of these drones can be seen on my Youtube channel linked below. My sophomore and junior years of college I led one of the subteams of the the Robotics Club Aerial team, focusing on projects such as enhanced power distribution, a custom gimbal design, and a system of LED's that changed color based on the distance to an object, used to assist when landing and flying drones close to objects. Sadly my senior year my senior design project has taken up to much time to allow my to continue as a team lead for the club, but I still come in during meetings and help with what I can and with the knowledge I posses. Personally, I own three drones; a small racing quadcopter, a small tricopter, and a larger quacopter with a gimbal. Both small drones use a CC3D because of its simplicity and quick reaction times while the larger drone uses a NAZA lite. While many of my hobbies involve technology and working indoors, I do enjoy working outdoors and experiencing nature. Two of my favorite outdoor activities are hiking and biking. For hiking I usually like doing day hikes though sometimes overnight and backpacking trips are fun too. Two great easy places to hike that I enjoy are Pinnacles National Park, down in the Salinas Valley, and Bothe State Park right outside Calistoga. Both are great places that provide beautiful scenery and not too difficult hikes, but something to at least get the blood pumping. Below are some pictures from Pinnacles I took when it was still just a National Monument. Biking is another great outdoor hobby that I enjoy and that I even get to do in the winter months thanks to the Dixon Recreation Center on campus. When I can though I enjoy biking outside. When in Corvallis this includes riding out and around Bald Hill. 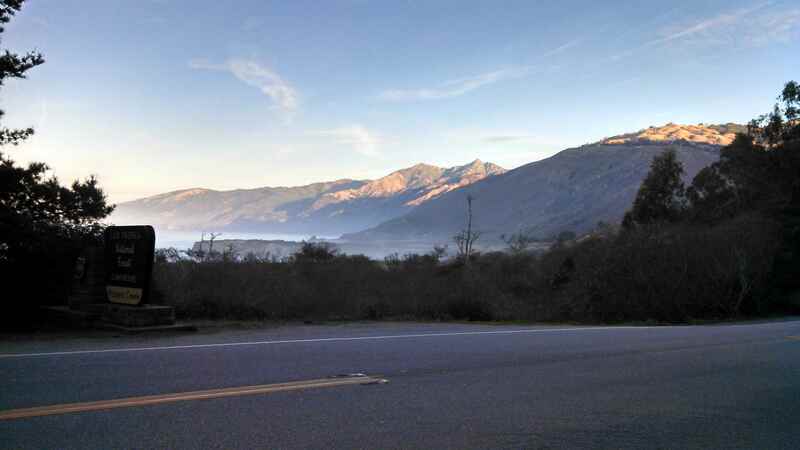 One of my favorite areas to ride is the central California coast. For easy rides, riding through Monterey, 17 Mile Drive, and Carmel are great especially on a sunny day. Another great ride I got the opportunity to participate in was the Best Buddies Challenge. A charity ride that supports the Best Buddies organization whose goal is to help families of children with Autism support their loved ones. 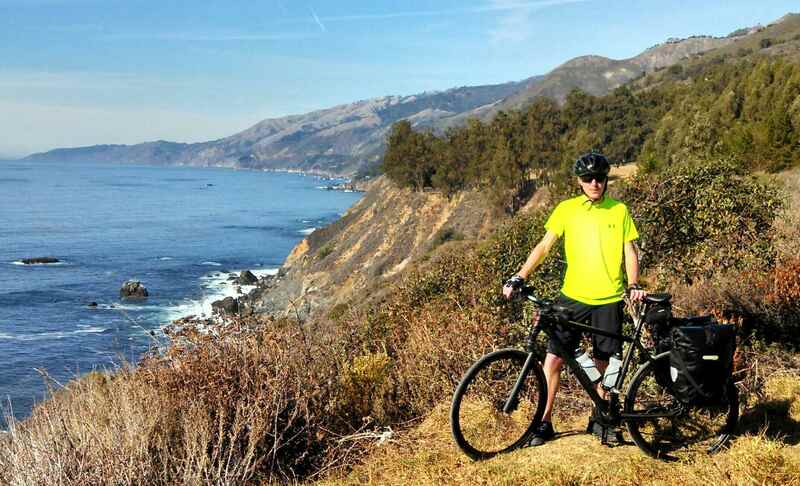 The ride consisted of multiple different length rides down along the Big Sur coast from Carmel to Hurst Castle. 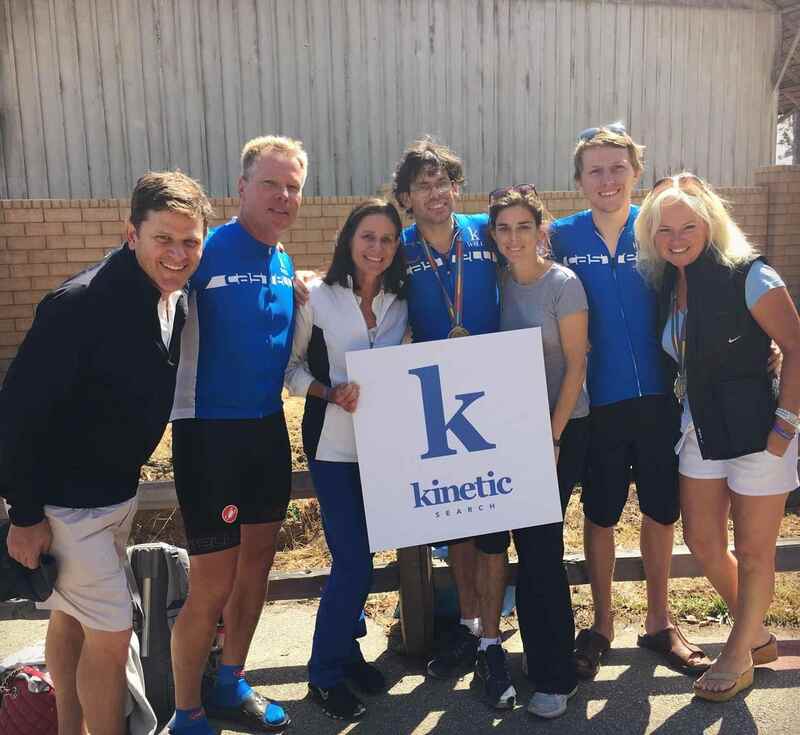 It was a wonderful ride for a great cause and something I would love to do again given the chance. My father and I have done the same ride over three days between Christmas and New Years Eve; carrying all our camping gear and food along with us. It was another interesting experience and very unique, carrying everything with you and camping along the way makes you thing differently when packing, and also while riding. Below are also some pictures from that trip as well.